The family of Donald Trump’s son-in-law and adviser, Jared Kushner, apologized for using his name in a real-estate pitch in Beijing. The deal offers visas in exchange for $500,000 of investment. In questioning immigration, Trump hasn’t raised the EB-5 program. He should. 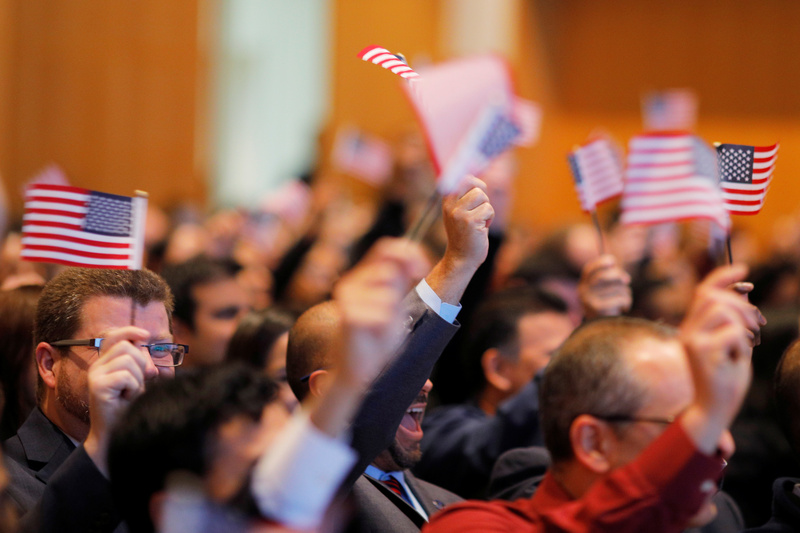 New U.S. citizens wave U.S. flags during a citizenship ceremony at the John F. Kennedy Presidential Library in Boston, Massachusetts, U.S. February 8, 2017. Kushner Companies on May 8 apologized for invoking Jared Kushner’s name during a pitch in Beijing for a real-estate project in New Jersey. The firm is owned by the family of Kushner, a senior White House adviser and son-in-law of U.S. President Donald Trump. Nicole Kushner Meyer, Kushner’s sister, mentioned his White House role during a presentation to investors on May 6. "Ms. Meyer wanted to make clear that her brother had stepped away from the company in January and has nothing to do with this project," the company said in a statement. The project relies on the EB-5 visa program, which offers foreign investors a path to permanent residency in the United States in exchange for at least a $500,000 investment which creates at least 10 jobs. In fiscal 2016, the U.S. Citizenship and Immigration Services approved more than 7,600 EB-5, while almost 21,000 applications are pending. At least one property branded with the president's name, Trump Bay Street, attracted investment through the EB-5 program. The New Jersey apartment building, which opened in 2016, was partly developed by Kushner Companies.